In fairness to my iPhone 3G, it served me well and I would have kept it probably for another year had I not upgraded the operating system to iOS4. Right after installing the new system, the phone was rendered useless. Well, pretty much. It became so slow and sluggish that answering a call or sending a text message was an ordeal. Here’s a comical video clip that shows what I’m talking about. It’s poking fun at the iPhone commercial but it’s really how it is after installing the new OS. There’s definitely a lot more features I have to play with and explore in this new iPhone. For now I’m just gonna pay respect to my old iPhone 3G one last time. 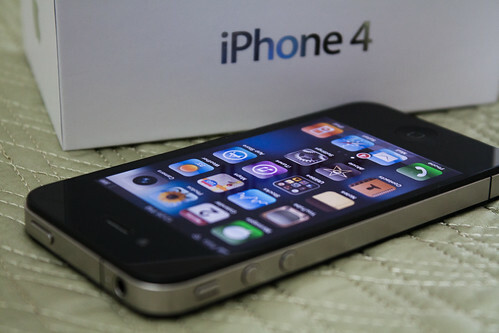 This entry was posted in Gadgets and Toys and tagged apple, cellphone, iPhone 4. Bookmark the permalink. Post a comment or leave a trackback: Trackback URL. Congratulations! I want to get one too but the waitlist here in Norway is long. Ulk. Thanks M! Oh, it was a mayhem here during the launch. We were lucky enough to get them directly from the Apple store but the line-up was still long. I’m sure it won’t be long for the new stock to arrive.